I can not create my account or sign up for an event on the site, how can I do? Am I refunded in case of cancellation? What are my administrative and legal obligations? With which motorcycle can I participate in an event? What kind of tires should my motorcycle be equipped with? Does my motorcycle have to be equipped with accessories in particular? Can I come with rigid suitcases on my motorcycle? Can I participate with another type of vehicle (quad, SSV, 4x4, mountain bike...)? Is there a minimum age to participate in an event? What level is required to participate in an event? Can i participate to an event in duet on the bike? How to follow the route of a hike? How can I rent a Tripy II GPS? When and how will I receive the GPS track files? Does the route form a clover or are the places of bivouacs all different? Is it possible to leave a vehicle and a trailer at the start? Can I bring my partner or friends to join me on the bivouacs? Do I have to transport my bivouac material on the bike? What are the differences between the "Extreme" trace and the "Adventure" trace? What is the purpose of the "bitumen" trace? How fast can I ride during the stages? Can I overtake other participants? Can I stop taking a break anywhere? Is there mechanical assistance during events? Does the organization come to help me in the event of a fuel outage? 1) create your account on our website (attention: 1 driver = 1 account = 1 name registration). 2) when registrations are open, complete the online form at the bottom of the relevant event page. 3) validate and then ensure your place on the event by making the full payment of your commitment, by card on our site, or within 10 days by bank transfer or check. The number of places is limited, first come, first served. - On which platform are you (PC, Mac, Andoid Smartphone, Iphone ...)? - Which browser do you use (Internet Explorer, Safari, Chrome ...)? - Does the problem involve creating an account, a shop purchase or an enrollment? - Describe the problem precisely. In case of total cancellation by the organizer: all the sums collected will be refunded. - The participant must inform the organization by email as soon as possible of the cancellation request. the participant is reimbursed for expenses incurred less a deductible of 30€. - In other cases or in the absence of supporting documents, the participant is reimbursed for the costs incurred, less a 100€ processing fee. - No refund can be granted for a cancellation request occurring less than 8 days before the date of the event or in case of abandonment during the course of the event. Registration is NOMINATIVE, non-transferable and non-exchangeable (whether between people or between events). It requires the creation of a user account on the website www.cocoricorando.fr. - Hold a valid Driving License at the event, and possess the category of Permit corresponding to the vehicle. - Have a vehicle complying in all respects with the rules of the Highway Code (see paragraph The Vehicle below). Our events taking place on paths and roads open to traffic, you can be perfectly controlled by the Forces of the Order during the weekend. You make your case of any contravention or offense found by them in respect of you, whether it is about the conformity of the vehicle, the respect of the speed or other. Our events and tracks are designed with and for "maxitrails" (examples: Africa Twin 1000, Super Ténéré 1200, GS 1200 ...). 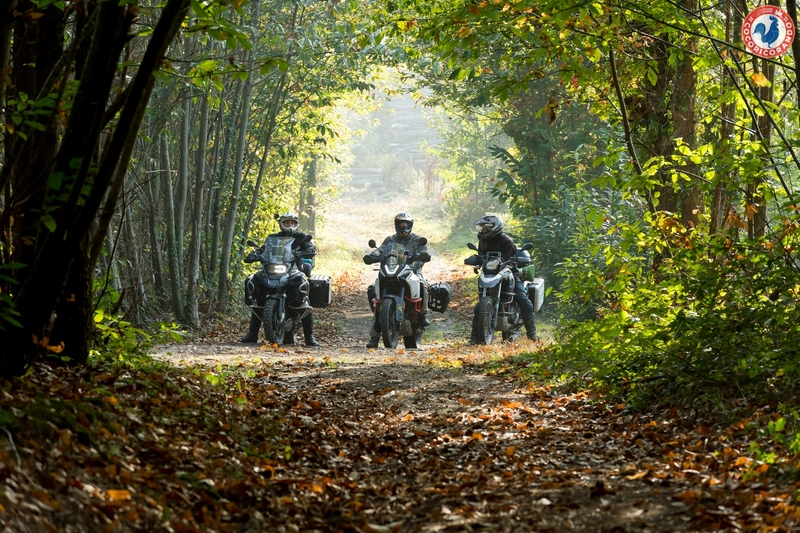 Medium-sized trails are also welcome (examples: Ténéré 750 or 660, Transalp, DR ...). The "old grannies" as well as the sidecars are adapted and generally feel. Our concept being the adventure in maxitrail through the roads and small picturesque roads, we do not speak of "rando TT" or "enduro". Also lighter or enduro bikes are accepted but not recommended. By regulation, the minimum engine displacement is 125 cc, the minimum recommended displacement is 600 cc. Whatever the bike, it must be equipped with teat tires or crampons. (Examples: Michelin Anakee Wild, Mitas E09, Continental TKC80 ...). Tires called "mixed" (example: Continental TKC70, Metzeler K60 ....) Are prohibited. If in doubt about a type of tire do not hesitate to contact us. Technical verifications can be put in place at the start of the events. The organization reserves the right to exclude any participant who does not respect this point or any other point of the event rules. We strongly recommend that the motorcycle be protected for maximum protection in the case of a fall, with guardrails, a "real" engine shoe and reinforced handguards. Can I come with rigid side-cases on my motorcycle? Yes, rigid baggage (like aluminum side-cases) is suitable. The proposed paths are sufficiently wide. It will be necessary, however, to keep in mind the total width of the bike, because we can not obviously certify that you will not encounter a branch, stone or other embankment camouflaged in the vegetation! For information, we make our "recos" with a maxitrail (usually a CRF1000) equipped with aluminum side-cases of our partner SW-Motech well loaded. Can I participate with another type of vehicle (quad, SSV, 4x4, mountain bike ...)? No, Cocoricorando events are reserved for motorcycles such as trails and maxitrails, as well as sidecars. And if you wonder if there is a maximum age: no, provided of course to be in good physical and mental conditions. - For a first "offroad" experience : our events are quite feasible without any off-road experience, provided that you have a suitable bike and equipment, dummy tires, a lot of humility and common sense, and start with the "Adventure" plot (see the paragraph what are the differences between the "Extreme" trail and the "Adventure" trail?). Accessible, but not easy! The mistake often found is to say that knowing already driving a bike and having an impression of ease according to some videos, you jumped too frankly! Technically driving differs in many points compared to the paths, and varies depending on the type of terrain (sand, mud, pebbles ...). She therefore asks to be discovered little by little, or if one is in a hurry, to move towards a preliminary offroad stage, or to participate in the March Moto Madness France, which takes place at the end of March in Dreux, and which makes it possible to discover the offroad at your own pace with driving advice. - "Offroad" driving for the most experienced : it must be wise !! It is about friendly tourist walks, quiet, the participants having to leave a beautiful image of their passage. On the slopes and "rolling" paths: do not exceed 50 km/h! Wherever it seems necessary to slow down: do not hesitate to slow down a little more! To go to 30 or 40 km/h to a few meters of children, dogs, horses, windows of houses in small hamlets, it is still much too much. Stay on first gear, about 10 km/h over a few hundred meters, will prevent noise, dust, accidents, and give a smile to residents and other potential hunters! Any participant who does not comply with the Highway Code, or the instructions of the organization, or whose behavior would be likely to harm his own safety, that of others or the smooth running of the event, would be excluded and registered on "blacklist". Yes. Even if the off-road duo is not common, as it is not comfortable for the passenger or the driver, it is quite possible to participate in one of our duet events. An off-road experience of the rider and the passenger is highly recommended. The passenger of a duo is considered as a accompanying. To register as a duo, add the accompanying option when registering the driver. In addition to the legal obligations of the Highway Code, the organization is not responsible for your common sense: you make your business your equipment and therefore your safety. - Protections / hulls on the joints (knees, elbows, clavicles, dorsal, hips ...), integrated in clothing or in the form of a vest or separate elements. It is good to ask this question a little in advance, because even if the answer is a bit of everyone's business, it requires reflection. - For autonomy: enough to repair a puncture and some basic tools. - For the rest (number of briefs, etc ...): it's your business! A luggage transport option by the organization is available at registration. Some will say that it is expensive, it is voluntary! The idea being, besides financing the logistics, is to incite to carry his luggage on his bike to stick more to the trip! Each participant follows the courses provided on his GPS, there are no signs on the courses. If you do not have a GPS, you can rent a GPS TRIPY electronic roadbook reader at the price of 110 € for 3 days. The TRIPY is probably the most suitable GPS for this context, thanks to its precision, many personalized waypoints that clearly indicate each change of direction or tourist points for example, and also thanks to its autonomy of more than 15 hours that allows you to ride serenely all day and to put it in charge only in the evening on the bivouac. You just need that your GPS to accept the import and playback of GPX files. It must be able to display a GPX track with non-tarred tracks (some GPS accepting GPX do not know how to display "foolishly" a plot without attaching it to existing road in their database, it means that they will recalculate the trace in their own way to display something wrong). It is strongly recommended to check the integration of the files in your equipment as soon as they are received to check that everything is in order. The organization will no longer be able to help you if there is a problem the day before or the morning of departure. Take away the slightest doubt in advance, for example by doing some tests with GPX "offroad" files found easily on the Internet. The option is available on the registration form of the event when registrations are open, on our website www.cocoricorando.fr, at a price of 110€ including all taxes for the 3 days of the event. You have nothing to predict technically: the device and the necessary to fix it on your motorcycle will be given to you the morning of the departure, and you will be "briefed" on its use before leaving. You will receive the tracks of all the courses proposed on the event: "Adventure", "Extreme" and "Bitumen", in order to personalize your journey as you see fit. - PDF files for paper unwinders (on request). This is variable depending on the event and the years. - on the Paris-Dunkerque in general: the places are all different, we go from point A to point D through 2 separate B and C bivouacs. - on the Vercingetorix, the Cathare Moto trail and the Royale in general: the place of departure is the same as the place of arrival, and the 2 bivouacs are at the same place (A=>B, B=>B, B=>A), Step 2 of Saturday is a loop that allows you to leave the tent installed for the second night. - on the Vercingetorix, the Cathare Moto trail and the Royale: yes (see paragraph « Does the route form a clover or are the places of bivouacs all different? »). Note that this parking is provided by the organization in terms of space, but not guarded. Although the places are often quiet and remote, it is recommended to use a lock for the trailer. Yes, you can have accompanying persons who will be able to benefit from the equipment of the bivouacs, the dinners and the breakfasts, thanks to the accompanying option available at registration, at the price of 110 € ttc per accompanying person for the 3 days. Option limited to 3 companions per registered driver. These companions may incidentally carry your bivouac equipment and provide your own assistance. Not necessarily, but that's the goal of the game! The concept of these 3 days of adventure is based on autonomy and introduction to motorcycle travel. That said, an option of luggage transport by the organization is available at registration, at the price of 95 € ttc. Some will say that it is not given, it is voluntary! The idea being, besides financing the logistics, is to incite to carry his luggage on his bike to stick more to the trip! The "Extrême" trace offers paths with varying difficulty but still possible with a maxi-trail well loaded. This track is for bikers who already have a minimum of "offroad" experience. Any passage of this trace that will "tighten the buttocks" to a beginner offroad, whether blatant because the passage is impressive or almost anodune in the eyes of a regular but delicate for a first experience, is categorized "extreme", and thus leads to an easy bypass (very rolling road or nice little road). These workarounds form the "Adventure" trace. The 2 tracks are 70/80% the same, the Adventure is really planned to start. Obviously, the weather conditions can be said to reserve some surprises, even on the « Adventure » trail. The choice of course requested at registration is simply indicative for the organization and does not commit to anything. The goal is to have fun on the way home. Each participant can customize his hike at will, at any time, from the Adventure to the Extreme or vice versa. What is the "bitumen" trace for? The "Bitumen" trace, as the name suggests, is composed only of tarmac roads, usually picturesque. It is never very far geographically from the other 2 tracks, and allows for example car companions to make a nice ride by joining their driver for lunch at noon. It also serves as a solution to "fallback" in case of bad weather or fatigue of a pilot to reach the bivouac more quickly. The start is given by small groups of 5 to 6 motorcycles, separated from one to 2 minutes. The groups are not defined in advance by the organization, they are trained on the spot, very naturally, during the score and the welcome coffee. The groups are not fixed for the 3 days, you remain free to ride with whom you wish, just make sure to keep groups of 5 to 6 motorcycles and to avoid groupings on the course or on breaks during steps. you travel on roads and roads, most of which are open to traffic, so you must comply in all respects with the rules of the Highway Code. reminder: this is a ride, without ranking or competition. You are in a way the ambassadors of our hobby, you must leave as beautiful a picture as possible of your passage, so that everyone can continue to roll in the paths. Do not adjust your speed according to your impression, but the environment and especially the impression of those who will watch you go by, far or near. You are autonomous on the track, so you can overtake other participants (if your speed does not become excessive!). In this case, make sure, for example, that the pilot you are about to overtake has seen and understood your intention, and do not surprise him (it is not a question of saying after a collision). between participants: "I thoughtthat he had seen me... ", but to wait to be sure that the passing will go well!). Do not forget that experienced riders and newcomers alike are on the road, and that sharing and respect must accompany all your riding decisions so that everything goes well. You will refuel autonomously in the service stations marking the track or near it, a list (not exhaustive) of stations will be provided before departure. The autonomy of a maxitrail allows you to go through a whole stage and simply refuel at night for the next day. Note that it is strictly forbidden to take a jerry can or other fuel can to the meeting places of the event. Nearly ! In principle, you take breaks whenever you want, just respect the Highway Code, and secondly the prohibition to ride off-road: on unpaved sectors, even for parking for a break, it is strictly forbidden in France to put his wheels off the road. Be careful also to avoid major groupings, not to obstruct the passage of other participants, users or emergency vehicles! It may happen on certain routes that coffee breaks or tasting of local products are offered by local residents or traders. 1. For "small" breakdowns or breaks, and punctures: it is necessary to play the autonomy, the trouble, the hack, the mutual aid and the solidarity. The preparation before the event is so crucial: are you in tube or tubeless? Do you know how to fix a puncture? What are the weaknesses of the bike? 2. For breakdowns or repairable intermediate breaks: the organization picks you up and brings you back either to the professional mechanic who accompanies the event (repair services to pay him directly), or to the bivouac, in all cases the intervention n ' takes place only to allow to start again in the day or the next day. 3. For breakdowns or final breaks: the organization can not do anything for you any more and therefore does not intervene in order to focus on the participants concerned by the 2). You therefore call your own assistance (accompanying persons or insurance). No ! It's up to you to predict, to anticipate. A non-exhaustive list of service stations in or near the tracks is provided at the start of each hike, with rarely more than 80 km between each station.